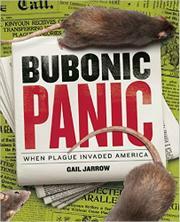 Following Fatal Fever (2015) and Red Madness (2014), Jarrow explores America’s experience with the bubonic plague. A devastating pandemic that started in Asia found its way to California in 1900, and Chinese immigrants in San Francisco were the first to fall victim. Efforts to stem the disease were led by the U.S. Marine-Hospital Service (later the U.S. Public Health Service). Suspicion and fear of discrimination among Chinatown residents and the reluctance of state and local political figures to acknowledge the outbreak initially held back progress. Changes in medical and political leadership brought about more success, until the San Francisco earthquake and unsanitary conditions in its wake led to the plague’s return. Jarrow’s detailed narrative and attention to the stories of the medical figures involved make this compelling reading. As in the previous volumes, the level of research on display is impressive, notably Jarrow’s close look at what has been learned about the rats and fleas that spread the disease and her smooth integration of social and medical factors into her discussion. The large number of photographs and illustrations enhances the text, and the layout is graphically interesting without becoming distracting. The interesting truth that the disease can still be contracted is among additional facts included in a FAQ section at the book’s conclusion.